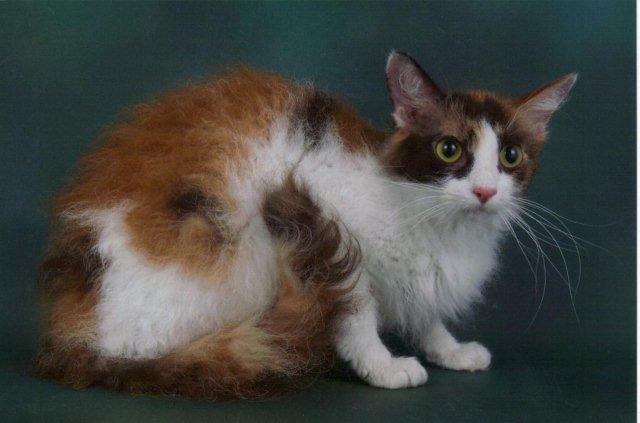 Quincunx Flibberygibbet is a Chocolate Tortie and White Longhaired LaPerm. Her father is Quincunx Curly Coyote, a Black LaPerm who we exported to Sweden. She is a giddy and playful cat who has a ceaseless appetite for playing fetch. She was a devoted and caring mother. She has done well at shows becoming a provisional qualifier. Her pet name is Mouse because when she was a very small kitten she looked more like a mouse. Omaste was the first LaPerm in the UK. Her name means Sunshine Through Mist in the Native American language Lakota. She is a lilac tortie & white longhaired LaPerm and was bred by Anne D. Lawrence in the States. She came to the UK in 2002 with her pets passport, coming via the Netherlands, and became the founding mother of the LaPerm here, arriving carrying a litter of five kittens. During her breeding career she had some lovely kittens and now that she's neutered she's still maternal and has always been a cuddly sort of cat. She has also done well at cat shows, becoming both a GCCF preliminary qualifier and a provisional qualifer- helping the breed move through the stages of the recognition process. She is also a champion in TICA. Siouxsie was the first LaPerm to be born in the UK. She was an odd eyed cream and white female van patterned longhaired LaPerm. She was a loving little purr-box and and was always asking for cuddles or shoulder rides. She did well at cat shows becoming a TICA champion in one show, being a GCCF provisional qualifier and having been Best In Show Neuter at the Rex Cat Association show 2011. She was a very devoted mum and produced many lovely kittens. 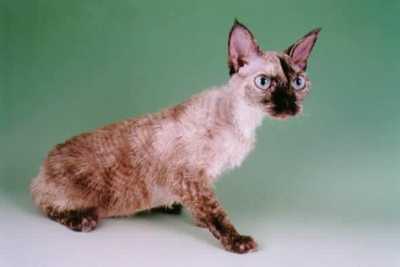 Holly was our chocolate tortie point Devon Rex. Her pedigree name was Murrmal Pansy and she was bred by Hazel Hillman.She lived to a grand old age and is greatly missed by us all. She was a close and loving companion. She was a good mum to her kittens and an earth mother and auntie to everyone else's kittens. For more information about the Devon Rex see the websites of the Rex Cat Association, Rex Cat Club and Scottish Rex Cat Club on the LINKS page. 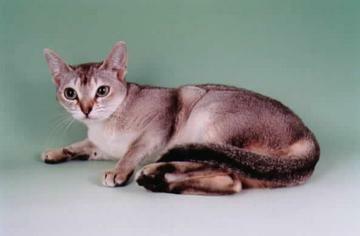 Mabel was our Singapura, bred by Debbie van den Berg. She was a sweet and gentle cat who was never happier than when she had a warm spot to snuggle up in, especially someone's lap.